Lillian (“Libby”) Manuel née Schwartz was born in or around 1910 in the town of Sukhovolye (Polish: Suchowola), now northeastern Poland by the border with Belarus (a.k.a. White Russia), where she was originally known as Libe Shvarts or, among her townspeople, “Libe Yankl dem shvartsns” – ‘Libe, Black Jake’s [daughter]’). She immigrated to Philadelphia in 1926 and later lived with her family in New York City and northern New Jersey. She died in 1990. 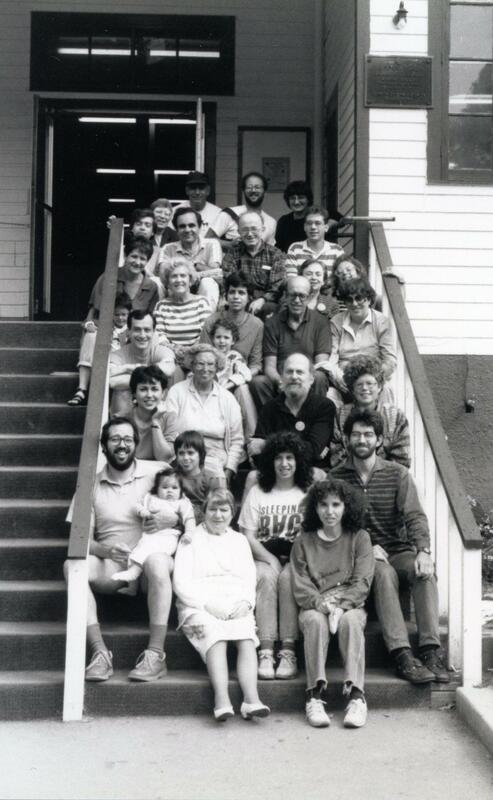 “Yiddish-vokh” at the Workmen’s Circle “Circle Lodge”, NY 1987. Libby Manuel is in the middle of the front row. Shirley Manuel top row at left. Dovid Braun is in the second to last row in a striped shirt. Photo courtesy of Itzik Gottesman (click to enlarge). She would reminisce about having sung all the time with her two elder sisters, Maryashe and Khay-Sore, who raised her, as their mother had died when Libe was in her very early childhood and their father was rarely home during the week, instead on the road in neighboring villages trading in hemp and other fibers which were used for rope and pig hair which was used for brushes. From what she recounted, the sisters kept a home-made songbook into which they’d write the lyrics to songs they’d learned. I am her grandson. As I was growing up, I recorded her singing in the late 1970s through the late 1980s. In 1980 she suffered a stroke which significantly affected her pitch and the strength of her voice, but her melodies were still generally discernible and her memory of long texts remained prodigious. Her love and habit of singing inspired her daughter, Shirley (Yiddish: Zelde-Leye) Manuel, to a musical career as a violist and teacher of string instruments, just as her attachment to Yiddish language, lore, and letters inspired her grandson. I recorded my grandmother performing Di gantse velt iz hevl-havolim (The Whole World is Vanity of Vanities) in the latter half of the 1980s. Variants can be found in the folkloristic literature, sometimes under the name based on a slightly differing first stanza, “Hevl iz havolim” (‘Vanity is vanities’) or “Un Hevl iz Havolim‟ (‛And Vanity is Vanities‛). One version was typically performed, as her signature song, by the late activist for secularist Yiddishism Gerry Revzin of the Chicago area (thanks to the late Max Rosenfeld of Philadelphia for this information). A particularly long version appears in print in Ginzburg-Marek (song #124, no melody); others are in Beregovski-Fefer 1938 (pages 384 – 385 with melody), Ruth Rubin’s Voices of a People (pages 54-55). I. L. Peretz cites the song in his essay ‟Dos yidishe lebn loyt di yidishe folkslider‟ (Jewish Life As Reflected in Yiddish Folksongs), YIVO-bleter 13:1-2 (1937). In volume 9 of Idelsohn‘s Thesaurus of Hebrew Oriental Melodies, page 178, a verse with a different melody is printed. All versions of this song are introduced by the Hebrew and Yiddish phrase that corresponds to those words beginning and ending the biblical book of Ecclesiastes, namely, “Vanity of vanities!” (or in other translations: “Absurdity of absurdities!”, “Futility of futilities!”, “Utter meaninglessness!”, “Sheer emptiness!”). According to Mrs. Manuel’s account, this song was beloved by her next-door neighbor in her shtetl, her sickly Aunt Itke, who would frequently warm herself by the oven and would have Libe entertain her with this song. Mrs. Manuel believed there was a continuation to the song but didn’t know any more of it herself. In the recording presented here, the melody of the first two stanzas is slightly different from how she sang it on other recorded and unrecorded occasions, and in hevl-havolim, we hear a diphthong in the first syllable ([eyvl]) which, again, was not her typical way of pronouncing or singing that first word – it was usually [evl]. Her dialect lacks [h]. un zi shteyt dokh nor on gelt. and it’s constantly without money. un vos alt iz nit nay. and what is old is not new. un vos raykh iz nit orem. and what is rich, is not poor. un vos reydn iz nit shtum. and what is straight is not crooked. and what is spoken is not mute.